We’d love your help. Let us know what’s wrong with this preview of Beautiful Affliction by Lene Fogelberg. Lene Fogelberg is dying—she is sure of it—but no doctor in Sweden, her home country, believes her. Love stories enfold her, with her husband, her two precious daughters, her enchanting surroundings, but the question she has carried in her heart since childhood—Will I die young?—is threatening all she holds dear, even her sanity. When her young family moves to the US, an an Lene Fogelberg is dying—she is sure of it—but no doctor in Sweden, her home country, believes her. Love stories enfold her, with her husband, her two precious daughters, her enchanting surroundings, but the question she has carried in her heart since childhood—Will I die young?—is threatening all she holds dear, even her sanity. When her young family moves to the US, an answer, a diagnosis, is finally found: she is in the last stages of a fatal congenital heart disease. But is it too late? To ask other readers questions about Beautiful Affliction, please sign up. I want to say that Lene is a very lucky woman that she is alive today to share her story. What an amazing story it is. Lene was born with a heart murmur that left untreated for many years lead to a fatal congenital heart disease. One that left Lene trapped in her body with the heart of a ninety year old woman. I was intrigued by Lene's story because my sister's oldest son had to have heart surgery when he was just a baby. He was born premature at 6 months old. Barely weighing over 2 pounds. He h I want to say that Lene is a very lucky woman that she is alive today to share her story. What an amazing story it is. Lene was born with a heart murmur that left untreated for many years lead to a fatal congenital heart disease. One that left Lene trapped in her body with the heart of a ninety year old woman. I was intrigued by Lene's story because my sister's oldest son had to have heart surgery when he was just a baby. He was born premature at 6 months old. Barely weighing over 2 pounds. He had to stay in the hospital for about 3 more months. He is now 13 years old and you can not tell that he was ever born premature. So reading this book I could imagine what it could have been like if the doctor's had not caught my nephew's heart condition in time. The way that this book was written with the present and then the different formatting and font of Lene's thoughts was nice. I really felt like I got to get close to her this way. When Lene would have an attack with her heart and she felt trapped in a bubble, there was a time or two where I too felt as if I was trapped in that bubble with all of the oxygen sucked out of the room. I found this book to be a very well written read. I was drawn into this book from the beginning. Before I knew the story, Lene Fogelberg’s skillful writing promised to bring me along on her journey with honesty and respect. And what a story it is. It’s about intuition, love, weakness and strength. Family, faith, heritage. And always poetry. One of the themes that I connected with is that of trusting one’s intuition. Intuition for one’s own health and well-being is often contradicted by those professionals who “know better.” And we learn to trus I was drawn into this book from the beginning. Before I knew the story, Lene Fogelberg’s skillful writing promised to bring me along on her journey with honesty and respect. And what a story it is. It’s about intuition, love, weakness and strength. Family, faith, heritage. And always poetry. One of the themes that I connected with is that of trusting one’s intuition. Intuition for one’s own health and well-being is often contradicted by those professionals who “know better.” And we learn to trust others’ understanding of our bodies rather than believe what we know to be true about our own selves. Lene literally heard her heart telling her something was wrong and it took years to have anyone take her complaints seriously--except for her steadfast husband. Many passages spoke to me personally, but one has stayed with me since I finished the book: “And that is just it, maybe these things only come to the weak, because in strength the body only knows itself, is full of itself, its movements its words, but in weakness is the invisible and the whisperings. In the moment before the darkness falls, there is the answer to the riddle, with a finger over its lips: Shhh, don’t say anything, just listen, but what am I supposed to say?” This struck me as an insightful and important understanding; intuition at its finest. Even long before it existed, I wanted to love it. Several years ago, my mother-in-law (who knows Lene’s mother) told me about Lene’s move from Sweden to Philadelphia, and how it resulted in her life saving open-heart surgery. Even back then, Lene’s story gave me chills. And then several months back, I heard Lene had written a book about her life journey. A fellow writer! A fellow writer, who is also a Swede living abroad! I had to investigate this girl. One visit to her blog later, and I k This. Book. One visit to her blog later, and I knew I’d stumbled onto something – and someone – special. Over the past several months, our online friendship has meant surprisingly much to me. So naturally, I was excited to dive right into Lene’s book the day it arrived on my doorstep. Excited, and also afraid. What if I didn’t like her book as much I wanted? What if my admiration for her and my blind trust in her abilities had created expectations too high for her memoir to live up to? On the very first page, the tension in my shoulders melted. Yes. I knew I was right to trust Lene. But I have to be careful. I don’t want to create hype – hype is difficult to live up to, even for a memoir as extraordinary as Lene’s. -Savor a glass of apple juice, just to make sure it really isn’t the solution to all the world’s problems. -Almost-hug Lene’s heart surgeon. And possibly almost-slap some of her other doctors (on second thought, scratch the “almost”). -Bring out a tape measure, to see just how much scarring Lene had post-surgery. -Count the number of words in that crazy-long sentence that hits you right in the ribs. -Call all your friends and family and ask them how they are really doing and how you can help, because afflictions are difficult enough without the heavy burden of loneliness. The rest is yours to discover, and savor, and above all – feel. At a few points early on in the story, I did feel that Lene and her marriage seemed a little too good to be true, a little too near-perfect (apart from the problems related to her illness, of course). And then I read the next few chapters and I saw and felt her struggle and I thought yes, she is real, and yes, I can relate! Guys, this is Lene’s first book. Her first! I have not yet had any books published, but over the past many years I have stacked up about ten novel-length manuscripts and over a hundred picture book manuscripts. I am trying very hard to not be jealous of Lene’s ability to mesmerize. Yes, Lene almost lost her heart. Perhaps that is why she is so adept at touching ours. Beautiful Affliction is a stunning debut memoir about a young woman whose fatal congenital heart condition is dismissed by the medical community in Sweden. But, it isn’t only the topic that makes this memoir a page-turner. Lene Fogelberg weaves a riveting story of fear of impending death, invalidated for years as she struggles with daily fatigue, dizziness and shortness of breath. She knows something is wrong and often feels she is going insane while putting up a valiant front for her husband an Beautiful Affliction is a stunning debut memoir about a young woman whose fatal congenital heart condition is dismissed by the medical community in Sweden. But, it isn’t only the topic that makes this memoir a page-turner. Lene Fogelberg weaves a riveting story of fear of impending death, invalidated for years as she struggles with daily fatigue, dizziness and shortness of breath. She knows something is wrong and often feels she is going insane while putting up a valiant front for her husband and two little girls. Underlying this daily challenge is the deep love that she and her husband, Anders, share. I felt the love, the frailties, the fears. It’s her prose--lyrical and fluid-- which kept me up way past my bedtime. I could not put the book down and read it in one sitting. She brought me right into her story with ease through her vivid details and genuine voice. It flows seamlessly through rocky terrain and against the backdrop of seemingly impossible odds. Even though I knew she survived, it still kept me on edge. Her use of flashbacks is very effective as she alternates chapters between her past and her present leading up to the heart surgery that saved her life. This serves to build the tension and kept me highly engaged in the story. The circumstances of her ultimate diagnosis and treatment are nothing short of a miracle. Definitely my best read book of 2015. This book, a memoir of a woman's undiagnosed heart ailment and how she survives, is so full of beauty and moments that soar. And then catch your breath. She describes her daughters, and I see my girls. She writes of awakening after surgery, and I feel trapped and airless. She tells about post partum depression, and I am there in that hopeless place. Yet, oddly, it's not bleak. It's beautiful. All of it. I keep coming back to this book's entry here to see how Definitely my best read book of 2015. This book, a memoir of a woman's undiagnosed heart ailment and how she survives, is so full of beauty and moments that soar. And then catch your breath. She describes her daughters, and I see my girls. She writes of awakening after surgery, and I feel trapped and airless. She tells about post partum depression, and I am there in that hopeless place. Yet, oddly, it's not bleak. It's beautiful. All of it. I keep coming back to this book's entry here to see how others are enjoying it, to hear how they love the language and the story of Lene's life. But how are there only 237 ratings? How have not more people read this? I want to physically put it in every reader's hands. I was not sure about this story at first. I did not want a depressing book. Boy, was I wrong. The author's writing is descriptive and beautiful. She describes her experiences so the reader feels her suffering, but she is not complaining or asking for the reader's sympathy. Instead we root for her and cheer her on. This was a well written and inspiring book. It was the perfect choice for Thanksgiving weekend. We should all be as grateful for life. I have never read a memoir before but after reading Lene Fogelberg's story I may just pick some more up. This memoir was absolutely beautiful. Her story and the way that it was written is amazing. I didn't feel like I was reading a memoir or "biography" type book. It kept me engaged and I would give it 10 stars if it went that high. I highly recommend this memoir. Thank you Lene for sharing your story with me!! This is one of the most moving memoirs I have read; also one of the most remarkable, both in topic and writing style. Lene Fogelberg is a poetic, honest writer with a strong voice to match her strong spirit. It is frightening how neglected her medical care was in Sweden; almost unbelievable that she could go all the way into adulthood and through pregnancy without a proper assessment of her heart murmur. Clearly if circumstances hadn’t sent her husband and their family to the US, Lene would not This is one of the most moving memoirs I have read; also one of the most remarkable, both in topic and writing style. Lene Fogelberg is a poetic, honest writer with a strong voice to match her strong spirit. It is frightening how neglected her medical care was in Sweden; almost unbelievable that she could go all the way into adulthood and through pregnancy without a proper assessment of her heart murmur. Clearly if circumstances hadn’t sent her husband and their family to the US, Lene would not have survived to write so eloquently about her long and emotionally terrifying journey, through the medical system in America, through double open heart surgery, and out the other side. It is a love story. It is a story of a courageous family; a story that probably would not have had the happy ending it did without Lene’s husband, Anders, who never failed to believe her when no one else seemed to, and supported her through multiple grueling decisions and procedures while caring for their daughters. Not easy in a strange country, where everyone speaks not ony in medical lingo but in a foreign tongue. Lene’s skill at showing, not telling, was the golden reason this memoir stands head and heart above most others for me. For example: I have heard many descriptions of the experience of being injected with contrast dye before undergoing a CAT scan, both from radiologists and from patients. Lene’s is by far the most evocative and the one that I am sure is closest to the truth. The difference between her experience and the experience of other patients in a similar situation is simply that Lene captures it in words. At first I feel nothing. Then it comes. The rushing, the heat, in all my blood vessels, large, small, arteries, veins, rushing, rushing, a waterfall in my body. In my head, my brain, somone creeping into my brain paths, a small electrician pulling wires, everywhere at the same time, the heat, the rushing, in my eyes, my neck, my arms, stomach, legs, feet, and I wet myself, I can’t help it. The rushing is over. (from Chapter 32, p183-184). Lene and her family, homesick for Sweden, returned there where health-care reform has thankfully now improved the situation for future patients. And as Lene writes in an Author’s note, she will always carry a piece of America in her heart. Absolutely a memoir to savour. I wasn't quite sure what to expect when I started this book because I chose not to read the back cover of the book or any other written information on the book. I wasn't even sure which "class" it fell under for my #FRC2015 challenge. The author, Lene Fogelberg has crafted a literary and beautifully compelling story about a mysterious 'monster' that is destroying her health and yet defies all medical attempts to find a cause. I had no idea about the health care in Sweden and the unavailability o I wasn't quite sure what to expect when I started this book because I chose not to read the back cover of the book or any other written information on the book. I wasn't even sure which "class" it fell under for my #FRC2015 challenge. The author, Lene Fogelberg has crafted a literary and beautifully compelling story about a mysterious 'monster' that is destroying her health and yet defies all medical attempts to find a cause. I had no idea about the health care in Sweden and the unavailability of doctors for months on end. It was very interesting to follow her story beginning at age 6 when they dismiss any potential issues as a non-threatening "heart murmur" which, left untreated and undiagnosed for nearly three decades, almost killed this woman. As she attempted to receive medical treatment, the doctors ended up convincing her she was a hypochondriac rather than look into the possibility of her really having anything wrong. I think about all the years she endured feeling so sick, quietly enduring a heavy chest, being tired unable to live a zestful life, not even knowing how good she could feel. Inside though, she knew - not exactly why she wasn't well, but she knew something - some monster - some "riddle" - was killing her. Slowly. I am glad Lene chose to share her story with the world. Her story and the way that it was written is incredible. ♦ Oh you guys! This, this is the memoir I have been wanting to read. Beautiful Affliction is so powerful and fluid, this could easily stand as a fiction novel, but the fact that it is a true tale makes it just so much more. When a three line email transcribed in a book makes you tear up, you know you have found something almost magical. While reading I was genuinely concerned that the main character would die. I would then have to snap myself out of it and realize she wrote the book, so very much alive. The writing was that good and that transformative that you will get caught in the moments and not realize you already know the outcome. I have been complaining recently about the lack of depth in the memoirs I have been reading; they seem more like lists and entries in a day planner. This is one that wipes my palette clean and reminds me why I love memoirs. The chance to experience a snapshot of someone else’s life, to live in and experience their world in a powerful way. I think it is an intrinsic part of human nature to be voyeuristic and when you can find a vessel such as this to dip into for a day, you are lucky. So in short, world, pacing, people, tone all fantastic. Go read this. What an incredible book! The poetically described narrative of a Swedish woman with a grossly abnormal heart, who never has her affliction diagnosed in Sweden, but then moves to the United States and learns from a cardiologist at age 31 that she has about 10 percent use of what Woody Allen might describe as her third-favorite organ. This deficiency has caused her to be exhausted her entire life and dismissed by teachers and even her parents as an unusually lazy child, whereas actually she was a What an incredible book! The poetically described narrative of a Swedish woman with a grossly abnormal heart, who never has her affliction diagnosed in Sweden, but then moves to the United States and learns from a cardiologist at age 31 that she has about 10 percent use of what Woody Allen might describe as her third-favorite organ. This deficiency has caused her to be exhausted her entire life and dismissed by teachers and even her parents as an unusually lazy child, whereas actually she was a child and eventual adult who was barely staying alive with a trickle of a blood flow in her body. The author describes her anticipatory fears of having open-heart surgery in the U.S., and how she may never survive it. Her description of what she remembers of the recovery period after the surgery is harrowing and poetically specific. I don't ever remember being so horrified and fascinated as I was by her description of the pain she went through. She relates it with a wrenching specificity that almost made me cringe at times. Her philosophical thoughts about her husband, her two daughters, and her parents as they witness and share her fear and pain are poetically described. It is a brilliant and anguishing book that is hard to put down. My only quibble is the book's structure of alternating chapters from the past with chapters from her current life. It's easy to follow at first, when she was just a child in the past, but as she gets closer to the time of the surgery, it was hard for me to distinguish which period of her life she was talking about. Her switching from roman type to italic in these alternating chapters helps to a degree. I joined SheWrites and immediately brushed shoulders with Lene Fogelberg, author of the rich emotion symphony called Beautiful Affliction. I understand the old tradition, for women, of knowing you are ill, but if the docs can't find a diagnosis, they tell you it's hypochondria. It is frustrating to read about Lene's struggle - understanding she is not well, but unable to get anyone to investigate what turns out to be a life-threatening heart problem. Lene's prose is like silk, swirling back and f I joined SheWrites and immediately brushed shoulders with Lene Fogelberg, author of the rich emotion symphony called Beautiful Affliction. I understand the old tradition, for women, of knowing you are ill, but if the docs can't find a diagnosis, they tell you it's hypochondria. It is frustrating to read about Lene's struggle - understanding she is not well, but unable to get anyone to investigate what turns out to be a life-threatening heart problem. We know, of course, that Lene Fogelberg pulls through. That’s not the point. 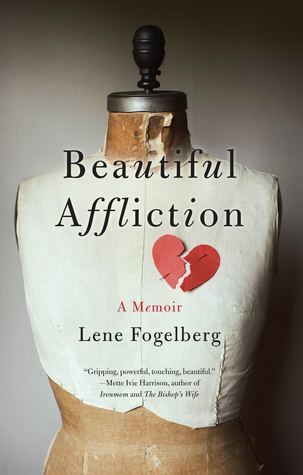 The point is that in her memoir Beautiful Affliction, we journey with her through the nearly constant, terrifying, painful symptoms that follow her from her native Sweden to the United States, where she ultimately discovers she is in the last stages of a fatal congenital heart disease. With exceptional detail, Fogelberg brings readers into her head as she struggles to breathe, to raise her two daughters without letting We know, of course, that Lene Fogelberg pulls through. That’s not the point. With exceptional detail, Fogelberg brings readers into her head as she struggles to breathe, to raise her two daughters without letting them know she is sick, and to navigate her homeland’s healthcare system that takes too long to figure out what’s wrong. I’m a fan of the flashbacks she uses to show how far back she had to deal with her condition. As early as the first chapter we are seeing the world—and the doctor’s office—through her eyes as a young girl: “I know what that is, it’s a stethoscope, my mom told me earlier.” Back and forth from the present to the past, we also learn about her relationship as she tries to acclimate to Philadelphia (where her incredibly supportive husband, Anders, has been transferred for work) while homesick and convinced—for a long time without a diagnosis—that she is dying. “live in the security of having their mamma with them forever” until the moment she stops breathing, acknowledges with a heavy heart that she has just lied to preserve healthy appearances. These are the types of details that keep a reader hooked. The questions behind the logic of her condition, the doubts about her sanity, the attempts to find meaning behind the seemingly meaningless. It all resonates deeply and powerfully through a story about living on the verge of death—and then getting a chance to live differently. Lene Fogelberg is a Swedish global citizen, a Wall Street Journal bestselling and award-winning author and a double open-heart surgery survivor. Growing up in a small town on the Swedish west coast, Lene Fogelberg developed a love of poetry and reading, nurtured by the rural surroundings of her childhood. She went on to study languages and creative writing at the University of Gothenburg and the St Lene Fogelberg is a Swedish global citizen, a Wall Street Journal bestselling and award-winning author and a double open-heart surgery survivor. Growing up in a small town on the Swedish west coast, Lene Fogelberg developed a love of poetry and reading, nurtured by the rural surroundings of her childhood. She went on to study languages and creative writing at the University of Gothenburg and the Stockholm Academy of Writing. Always curious, Fogelberg has embraced opportunities to study and live abroad, in France, Germany, the USA, Indonesia and Malaysia. She currently lives in Kuala Lumpur, Malaysia, with her husband and two daughters. An award-winning poet in Sweden, Fogelberg has always felt drawn to writing in English and switched language when writing the memoir Beautiful Affliction, a Wall Street Journal bestseller, a national gold medalist in the 2016 Independent Publisher Book Awards, and a finalist in the 2015 USA Best Book Awards and the 2016 International Book Awards. Beautiful Affliction is translated into German and published by Bastei Lübbe in October 2016, with the title Mein Glück kann jeden Tag zerbrechen. Fogelberg’s writing has been featured in The Huffington Post, Writer’s Digest, First For Women, Women’s World, We Heart Writing, She Writes, and Women Writers, Women’s Books.